My name is Arthur Livermore and I am here representing the American Alliance for Medical Cannabis, also known as AAMC. I wish to thank all of those who have worked so hard for so long to bring us to this moment in time when we can speak frankly and openly about cannabis as medicine. Little did I know then of the value and far-reaching effect that speech would have on me as I progressed through life seeking my own freedom to speak out and bring about a change of mind and heart toward the medicinal value of a prohibited plant. We stand here today as a positive reflection of that value. We stand here today for all of those who have been and are presently suffering untold miseries because they have and are using cannabis as an alternative medicine for their illness. We stand here today with one voice to alert the consciousness of our Federal, State and local governments that we will never give up on that which alleviates pain, reduces tremors in Alzheimer's disease, reduces alcohol abuse, reduces seizures, calms the nervous system of Attention Deficit Disorder, lifts the mood of depression, eliminates discomfort of irritable bowel syndrome, reduces the nausea and vomiting of chemo therapy for cancer patients, restores normal heartbeat for phobias and for myself, personally, balances my energy with bipolar disorder. We will never give up on that which prevents blindness from glaucoma, restores appetite to people with AIDS, prevents migraines, reduces inflammation in arthritis, treats premenstrual syndrome, menstrual cramps, and labor pains, and reduces pain and spasms in paraplegia and multiple sclerosis. In 1976, Robert Randall became the first patient to receive a Compassionate IND for the use of marijuana. Over the next 13 years the federal government reluctantly awarded a half dozen more. Then, in 1989, the FDA was deluged with applications from people with AIDS. The case that first called attention to the appalling consequences of the medical ban on marijuana was the government assault on Ken and Barbra Jenks, a Florida couple in their 20s who contracted AIDS through a blood transfusion. Both were suffering from nausea, vomiting, and appetite loss and their doctor feared that Barbra would die of starvation before the disease killed her. In early 1989 they learned about marijuana through a support group for people with AIDS. They began to smoke it and led a fairly normal life, regained lost weight, and were able to stay out of the hospital. Ken even kept his full-time job. Then someone informed on them. On March 29, 1990, 10 armed narcotics officers battered down the door of their trailer home, held a gun to Barbra Jenks head, and seized the evidence of crime, two small marijuana plants they had been growing because they couldn't afford to pay the street price. At their trial they used the medical necessity defense. The Judge rejected this defense and convicted them of felony marijuana cultivation, but gave them a suspended sentence. A higher court overturned the conviction and the defense of medical necessity was sustained. This story has been repeated time and again all over the United States. In Kentucky, James Burton, a Vietnam vet suffering from glaucoma, was given a year in maximum security prison and his farm was taken from him when he was caught with 2 pounds of marijuana on his 90-acre farm, even though a government-approved doctor testified at his trial that marijuana was the only medicine capable of saving his vision. In Oklahoma, Jimmy Montgomery, a paraplegic, was given a 10-year sentence for 2 ounces of marijuana he carried in the pouch of his wheelchair. In Tennessee, Bernie Ellis, a public health epidemiologist who uses marijuana to treat a degenerative condition of his spine and hips (and he also helped a few terminally ill people) has been fighting the government to keep his 187-acre farm from being taken after marijuana plants were found there. We now have 12 states with legal medical marijuana, but the Federal government continues to deny reality. We stand here today to let our voices be heard in the hearts of our lawmakers. Marijuana is our medicine! Our laws must stop hurting people like Ken, Barbra, James, Jimmy, and Bernie, who need this medicine. 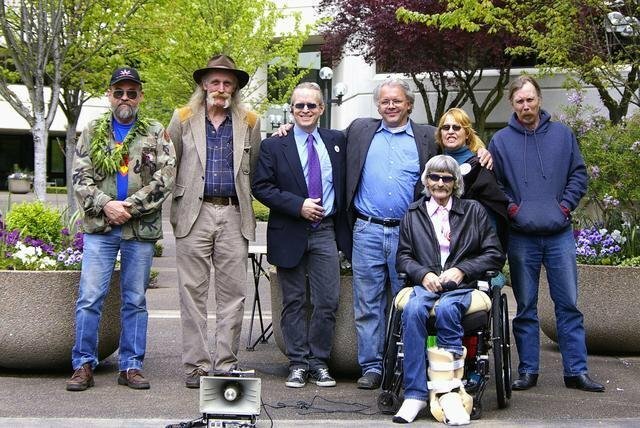 Eugene, Oregon May 5, 2007: (left to right) Dan Koozer, Arthur Livermore, Doug McVay, John Sajo, Elvy Musikka, Anthony Johnson, Jim Greig (seated). Photo by Allan Erickson.